Binding Deceit, Book 3 of the Undead Bar Association Series, is now available through Amazon and Kindle. The Kindle edition is on sale for $2.99, through May 1. The Undead Bar Association (UBA) was scattered. Some members hunted the undead, cheerfully taking on supernatural cases. Others turned resolutely to new careers and fresh relationships. One member, Maryanne, tried to escape the supernatural and her friends. She moved back to the one place where she thought nothing strange could happen, her hometown - Amarillo, Texas. You can run from the undead, but you can't hide, even in Amarillo. It doesn't take long for Anthony the ghost to find Maryanne, and drag her into an adventure that's too much for her to handle. Conjoined ghosts, evil sorcerers, undead professors, zombie cows ... what's a gal to do? Good thing Maryanne's got the rest of the UBA to turn to. Of course, getting help means she has to call them, and risk them learning the secret she's kept hidden since law school. And now, for you UBA blog readers, the inside scoop on the series from the author. 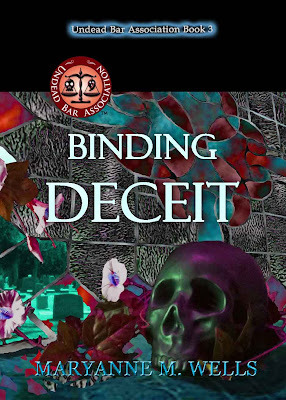 Binding Deceit is the first UBA book set in Amarillo, Texas. It won't be the last. This is Maryanne's hometown, and it becomes a focal point for the series. Roughly ever third book will be set in or near Amarillo. Why have a home base, and why in Amarillo? Three reasons. One, there are great UBA characters in Amarillo, characters from the original blog stories that I want to keep. Two, travel is about to ramp up for this series, and we all (readers, author, and character), need a home base. Three, Amarillo is a little messed up, and that makes it perfect for the UBA. In addition to the reasons for having a home base, there's an added advantage: a bonus story line. There's a new monster in the series, living in Amarillo. What is it? Hmm. I'm not telling, not yet. Not for several books. There will be clues scattered throughout the series, in the Amarillo books in particular. The amount of information will build and build, leading up to single book that will feature the monster. Though I'm not saying what the monster is now, I will tell you this: the individual was introduced in Binding Deceit. Want another hint? Right now, there are four possibilities. I'll keep them all in play until near the end. Then, I'll narrow it down to two. Maybe by then, you'll have it narrowed down to one. The next book in the series, Book 4, will shake things up a bit. Courtesy of our new found enemy, the Vildru, three of the UBA characters will be taking a trip back in time. What happens to them in the past will shake the all, Maryanne in particular. The book will be told from Robert's perspective. The history of Texas is in play. One wrong move, and the UBA may change the outcome of the Red River War and the face of Texas. Book 5 will be set in New Mexico. In Binding Deceit, there's some marked tension between Maryanne and a member of the original UBA, and that will come back to haunt them both in Book 5. And, they're not the only ones bothered by it. How can Tanya and Charles have a happy wedding, when their best man and maid of honor won't speak to each other? Of course, that becomes the least of the UBA's problems, once the Vildru and ghosts arrive. Expect an announcement about Book 4 soon, hopefully in the next week. There are big things coming.